Each time I start a new project I try to create something exploiting the latest technologies related to my passions. For this Project I decide to combine my passion for the motorcycle with my favourite hobby (use the Arduino). I have always been fascinated by the telemetry images that I see on TV about motogp race. Seeing images like below, I imaged how I could build it using my favourite gadget (Arduino) and my programming knowledge. So I decided to develop a telemetry system based on Arduino and Azure, that was easy to replicate in order that all motorcycle enthusiasts may have one in their motorbike. For do that I used an Arduino Uno R3, some sensors, an UWP deployed in a windows Phone and some Azure services. Phase 1 - All telemetries data are acquired from the control unit about twice at second (the control unit is positioned on the motorbike). Phase 2 - Each time that the data are acquired, the data are sent by bluetooth from Arduino to Windows Phone. Phase 3 - The data are displayed in the Phone (for more details please read "Software" section) and then sent by 3G/4G network to Azure IoT HUB. Phase 4 - On azure there is a Stream Analytics Job that receives the data from the IoT HUB and saves the informations in a SQL Azure database. Phase 7 - All data saved on SQL azure database are processed by a Machine Learning in order to retrieve information about your "driving style". The scope will be understand how to modify your driving style in function of the telemetry parameters in order to improve your driving performance. My hardware configuration is shown below. I used the SofwareSerial library to connect the bluetooth module with the Arduino and enable the wireless communication with the Windows Phone. A HC-05 Bluetooth Module was chosen for this scope, It is a class-2 bluetooth module with Serial Port Profile , which can be configured as either Master or slave. Next Step has been to change the Default Name of my Bluetooth device, the Default name was HC-05 ... it was not "attractive"
in order to change the defailt name is necessary use the AT Commands, in this LINK you can find an usefull step by step guideline. The communication between Windows Phone and Arduino is now ready and it was very easy! The hardware used for this scope has been a GPS-NEO7M module, it's a low power GPS module that has 56 channels and outputs precise position updates at 10Hz. 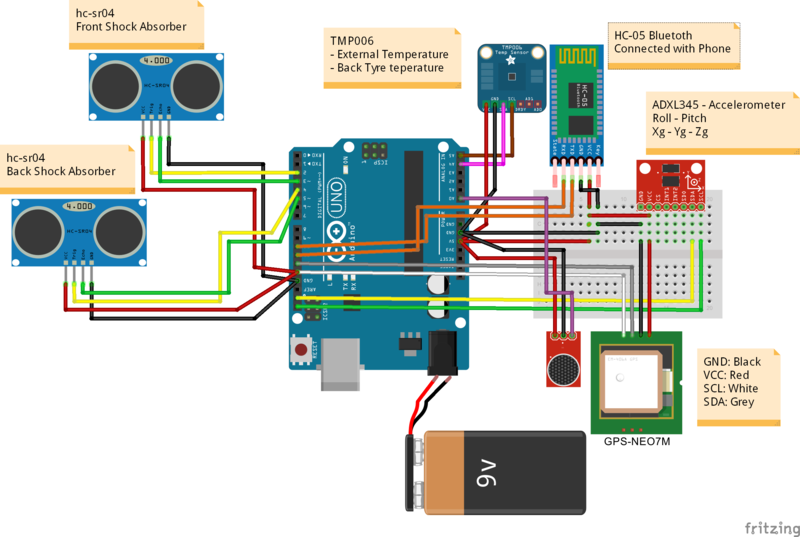 The communication between Arduino and the ADXL345 sensor happens using the ADXL345.h Library. Is very important understand that when you connect this sensor you will be able to determined the gravity acceleration in the 3 axes but the values are not immediately calibrated. You need to create a code for setting the OFFSET. I decided to determined the "zero point" in the first loop. To do that the G acceleration in the first loop will be the reference values that you have to subtract to the subsequent measurements. Then You have to compute the Lean Angle and the Wheelie Angle based on the g acceleration components. For more details please see the Arduino code attached to this project. The TMP006 are fully integrated MEMs thermopile sensors that measure the temperature of an object without having to be in direct contact. The thermopile absorbs passive infrared energy from an object at wavelengths between 4 um to 16 um within the end-user defined field of view. Now the question is, where i have to positioning my sensor? Looking the datasheet you can find important informations about the recommended distance between sensor and object. You have to observe the rule that the distance need to be lower then half radius of solid angle of the object. The value of the external temperature has been determined using and LM35 sensor (DT package). The LM35 series are precision integrated-circuit 1 temperature devices with an output voltage linearly-proportional to the Centigrade temperature. The purpose to use this sensor is to determined the escursion of the motorbike's suspensions. The HC-SR04 measuring the time taken by the sound waves to turn back after encountering an obstacle. The sound waves emitted beam has a conical shape and the same applies to the reflected waves from an obstacle. The sound waves speed in the air at 20°C is about 343,4 m/s, in this example for simplicity we will consider the approximate value of 340 m/s. Considering the kinematics law S=V x t (where S: space or displacement of the object, V:velocity, t:time) we can announce that in our case the distance is S=0.034 x T.
Below you can see an example that you can try to use to determined the distance of the object. The above code well describe how the sensor works but You'll discover that this code is very slow and poorly performed. For this project i decided to try the new library named NewPing.h for more details please visit this link and see the complete Arduino code of the project. Use the NewPing.h library is very easy. The software consists of an user interface connected to the control unit via bluetooth. The UI show all data sent from the Arduino and send to IoTHub the sensor values. The serial communication between Arduino and the UWP is interpreted by reading from the input string. Each String received is validated by checking that contains the START and END markers. If the input string is correctly formatted, the application will spit the information and show them on the application User Interface. In order to manage all data sent from central unit via Bluetooth, I have developed an Universal Windows Applications that is a fine example of the power of the UWP. As you know an UWP is a platform that allow you to run the application in all device family with Windows 10 on board. The user interface is very simple and intuitive, on the left side you can see the Bluetooth connection feature, in the middle 3 gauges used for show the speed, lean angle and Wheelie Angle. All G components are shown and on the right there information about the GPS position, temperatures and shock absorber excursions. NOTE: the APP developed for this project can be installed in all IoT device family like Raspberry Pi2/3 , Dragonboard 410c and Minnowboard Max. For more details Please visit the following LINK, In add, if you would like to deploy the app in a IoT device, remember to add the reference Windows IoT Extensions in your Visual Studio project. How to Deploy the App into the Windows 10 Mobile? With Windows 10 SDK Preview Build 10166, Microsoft was introduce the Windows 10 Application Deployment (WinAppDeployCmd.exe) tool. The Windows 10 Application Deployment (WinAppDeployCmd) is a command line utility that can be utilized to deploy a Universal Windows app from a Windows 10 PC to any Windows 10 mobile device. It allows users to deploy an .AppX file to a device connected through USB or available on the same subnet without requiring access to the complete Visual Studio solution. First of all move your mobile device in "Developer Mode" (go to UPDATE & SECURITY => FOR DEVELEVOPER). In the Create App Packages wizard, select NO If you want to create a local package and click NEXT. After that choose processor platforms to target. For our purpose choose ARM platform and click CREATE. At the end of creation process the wizard gives us a local URL where the package was created. opening the url you'll find the Appx file available to be deployed on the the device. A DeviceId that will be used to send data to IoTHUB. OK GO! Do you have an AZURE account? If NO, please go to https://azure.microsoft.com/ and create one. The IoTHUB is the access point of the telemetry values to the Cloud. Subsequently, in your Azure dashboard, you may see the IoT HUB deploying and after some seconds your IoT HUB will be ready. Click on the new tile in your dashboard and go to All settings blade. Ok...your Iot hub has been created successfully, you are almost ready to use it! The stream Analytics has the purpose of read and write all data sent to the IoTHUB and save them into a database table. Compile all fields and click on Create button. Now we are ready to configure Input/Output and the query of the streamAnalityncs JOB. Remember that if you don't have a STATIC IP in your network, and if you would like to work with your SQL Azure database in SQL Server Management Studio or in Visual Studio, you have to modify your Firewall adding a new rule for your IP. Now back to the STEP 2, we are now ready to create the StreamAnalitycs Query. Click on StreamAnalyticJob tile and select "Query". Insert your query in the right panel. As you can see, the query describes the process workflow. Catch the data from "MyTelemetryInputHub" and save them into "SqlAzureMyTelemetry" ... easy&wonderful!! At the end, we have only to start the JOB clicking the START button. Azure DashBoard: moving your attention on the dashboard you can see your control panel that it's look like this. This step is necessary in order to create a connection between my device and the IoTHUB. We need to create a new device identity and add into the ID registry of the IoT HUB. To generate a new one deviceId, you have to create a Console Application in Visual Studio. In the NuGet Package Manager window, search and install the Microsoft.Azure.Devices package. Add the below code In your Console application, replace your IoTHub Connection String and chose a deviceId alias (in my case the deviced is MyDucatiMonsterDevice). Run the console application (press F5) and generate your device key! A responsive web site allow me to see the telemetry data in all device type (mobile phone, tablet, pc, surface) and platform (Windows phone, Android, iOS). The website consist in a dashboard contains all my telemetries. The data has been read using the Entity framework from SQL Azure. Go to your Azure dashboard and click on you web app Tile. Select "Custom domains and SSL" and click on "Buy domains". Now is time to Introduce my motorbike, this is my Ducati Monster 695 that for this project has been the cavy. Below some pictures about my Hardware (control unit) mounted onboard. to measure the tyre temperature I created a bracket clamped behind the wheel. One Ultrasonic ranging module HC-SR04 has been fixed under the front headlight. It misures the distance between headlight and front mudguard. The other one Ultrasonic ranging module has been fixed under the bike seat in order to determined the back shock absorber measuring the distance between seat and rear tyre. The central unit containing the Arduino, the GPS, the Accelerometer and the external temperature sensor has been fixed behind the seat. The last idea of this project has been try to understand if exist a correlation between telemetries data in order to try to understand how to improve my driving style. My data samples are not relatable because I make different routes every time and the traffic conditions are never the same. I think that a good condition should be use the system in a speedway. I Imagine that in a real race could be usefull to understand by telemetry if you can increase the speed or if you have to decrease the speed according to the output values. The Machine Learning (ML) embodies the magic of software insights about the data, solves problems by giving information that represents a certain evolution. The ML understands how a given phenomenon will evolve according to the data in its knowledge. The first approach using the ML is to do Experiments. Using the data, you can play and be able to do the analysis with the aim of investigating the phenomenon that interests us. Go to https://studio.azureml.net and sign in using your Azure account. On the left of the page click on "Studio"
In the experiments blade, Click NEW (on the left button of the page). The first step is to Import data that you would like to use in your ML. In my case I imported the data from SQL Azure. Then add a SPLIT DATA element in order to use some data to Train your ML and decide the data percentage to use for the configuration. A data portion will be used to configure the template and the other portion to see if your model works fine. This will allow me to assess the goodness. Add a Train Model and decide what is the field that would you like the model guess and decide which algorithm use for your train. Now we verify how he behaved the algorithm giving us a feeling of goodness, to do that we need to use "Score Model". the SM accept in input 2 sources, the first one is from Train Model and the second one from the SPLIT DATA. At the end we ready to estimate the model according to the test data, comparing them with those that have not yet used (Evaluate Model). Below there is a sample experiment useful for comparing 2 algorithms using the Evaluation Model, the 2 algorithms are Two-class decision jungle and Two-class decision forest . The above metrics are reported for evaluating classification models. AUC measures the area under the curve plotted with true positives on the y axis and false positives on the x axis. This metric is useful because it provides a single number that lets you compare models of different types. As you can see, the Two-class decision forest Algorithm have an Accuracy, Precision ,Recall and F1 Score near the value equal to 1, so i suppose that my model is good described, GREAT!!! It's time to move our attention on the predictive functionality of the machine learning. The Training experiment will be convert to a predictive experiment, this feature allows to integrate in others applications the opportunity to use your model and based on your model have a Prediction. As you will see at the end of this section, We'll create a Web Service. This is very important if you would like to understand if your telemetries data follows your model and in order to understand if your driving style is correct or not. For do that, has been created a new one Experiment, the data source has been the SQL Azure but this time the table used has been a new one. I tried to classify data based on telemetry values. As you can see the result is equal to "SAFE DRIVING", this mean that my Predictive service has predicted that my driving style is Safe and no action is needed. If the Result has been for example "HIGH STRESS HIGH SPEED" that means that I have to reduce speed! in this section we understand some things. CURIOSITY: Are you enthusiast about Azure Machine Learning? exists a good website contains many dataset about many case study. Please visit the following url http://archive.ics.uci.edu/ml/ and try to develop an algoritmic for your first ML. In this project we covered many technological areas. We discovered How is possible to create a funny Hardware using an Arduino and some sensor spending less then 60$ and using many services provided by microsoft. We learned how is easy use Azure and how is interesting use Machine Learning Studio suite. Has been realized a prototype that certainly needs improvements but i think is a good starting point for future developments from each people enthusiast about C#, Azure, Arduino and MotorBike. About the mobile app (UWP), in case that no 3G/4G network is available, the data are lost because i'm not able to send the data to azure. Would be usefull develop a buffering logic that in case of "no networking" available, stored the data and send them at a later time. Create an APP for mobile platform using Xamarin, would be cool have an app who can run in Android OS and iOS also. Use more precise sensors and increase performance/accuracy. Make the central unit smaller, maybe using an Arduino MKR1000. Create a social media Webapp to share your motorbike travel and telemetries in order to suggest to biker users what is the dangerous curves and increase the safety. The new branch consists to sending back to device, through IoTHub, the information about the ML predictive service. When the speed value is greater than 100 km/h a new one stream analyticsJob will send the telemetry data to Event Hub. A cloud service reads this data from EventHub and send a request to the ML predictive service in order to have a score about the Driving Style. ... and now ENJOY !! :-) feel free to contact me for any questions and tips.